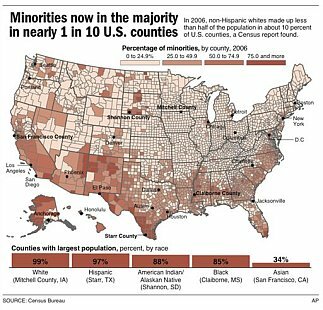 1 in 10 counties majority non-white. 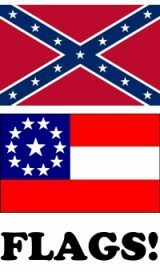 « Muslim Store clerk grabs shotgun from black thug but fails to shoot him. “Diversity Straining Race Relations,” says ABC News. Whites are now in the minority in nearly one in 10 U.S. counties. And that increased diversity, fueled by immigration and higher birth rates among blacks and Hispanics, is straining race relations and sparking a backlash against immigrants in many communities. As of 2006, non-Hispanic whites made up less than half the population in 303 of the nation’s 3,141 counties, according to figures the Census Bureau is releasing Thursday. Non-Hispanic whites were a minority in 262 counties in 2000, up from 183 in 1990. This entry was posted on Thursday, August 9th, 2007 at 3:13 pm and is filed under Uncategorized. You can follow any responses to this entry through the RSS 2.0 feed. Responses are currently closed, but you can trackback from your own site.